Australians have a love-hate relationship with spiders. Spiders inspire fear, especially dangerous species such as the Redback and Sydney Funnelweb. Yet, Peacock Spiders, whose males spread a colourful fan and wave their legs in a courtship dance to impress females, have won rapturous appreciation worldwide. 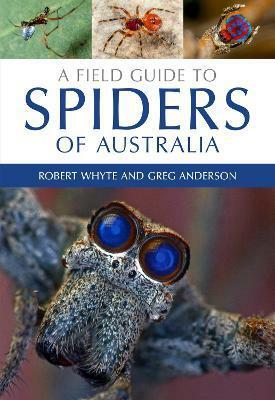 For a sneak peek of A Field Guide to Spiders of Australia check out this CSIRO blog post. Robert Whyte is an honorary researcher in arachnology at the Queensland Museum. He is an accomplished editor, author, and journalist with skills in photography and publication design. Greg Anderson is a biomedical research scientist and heads the Chronic Disorders Program at the QIMR Berghofer Medical Research Institute in Brisbane. He has travelled extensively around Australia and other parts of the world studying and photographing spiders.